The new Darkshore warfront event not only brings with it, daily world quests, it also contains event locked rares. As part of Darkshore warfront event, every time the Alliance retakes control of the region, they are given one chance to claim rare rewards from the rare enemies found in the area. We can continue to kill these rares as much as we like during the event, but we are only able to gain the rewards once per participation, meaning once per event cycle. The daily quests still renew every day for the events duration, but the rares themselves will not reset their loot drops until the start of the next warfront event. The locations for some of the rares are different for the Horde, or are replaced entirely with Horde specific rares. For this reason, we have compiled a map showcasing the location of every Alliance based rare for your convenience. Fear not though, for both the Horde and the Alliance have an equal number of Pet, Toy and Mount rewards. 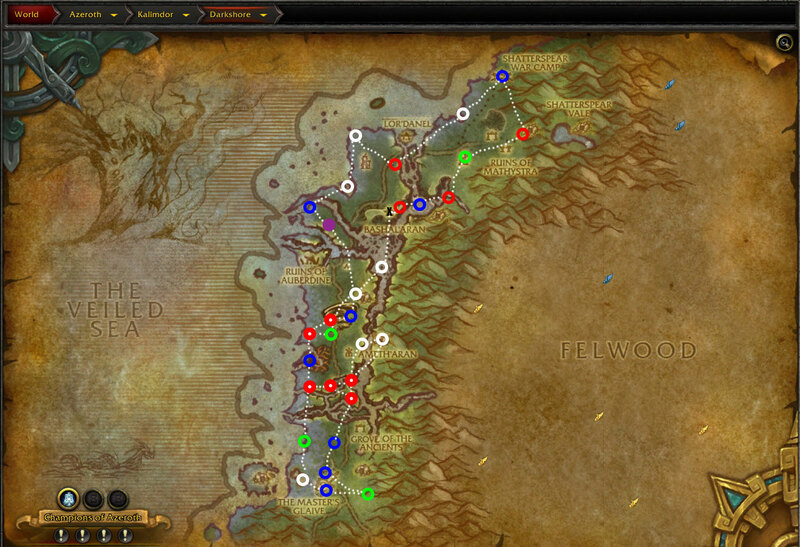 For our Horde players out there who may be reading this, we also made a detailed maps just for your guys as well. You may have noticed the different colored rings. Aside from Azerite Shards and general loot, each color indicates the location of a rare, and the items that drop.